Better stop being haunted by the 1950s and 1960s mentality. 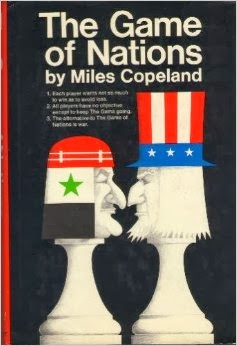 And better cast aside “The Game of Nations” book written by the famed ex-spy Miles Copeland. Local or international intelligence operatives can no more change the course of history, build nation-states, demarcate borders or create national leaders. Yes, they can sabotage a course of events or stop that course in its tracks, but they cannot reignite it or change its direction on a whim. Some people are slow learners and persist in being obsessed by grand bargains. Vast segments of the public still consider themselves “pawns on a chessboard” – another “book” that people should stop reading – and sit idly by waiting for whatever is decided for them. They would thoughtlessly subscribe to what columnists and political analysts propagate about plans in world capitals for “a grand political bargain” with Iran. The grand bargain with Iran would see her reconciling with the West, putting her nuclear ambitions on hold (albeit temporarily), and sufficing with nuclear power production. The deal would leave Syria, after its regime’s rehabilitation in one way or another, in Iran’s sphere of influence. In return, Saudi Arabia would get Lebanon as a consolation prize. A Lebanese government acceptable to Riyadh and amenable to Hezbollah would be set up. After the Arab Spring’s defeats and setbacks, “The Power of the Peoples” is still alive and kicking. It will surely affect the outcome of events despite all the agreements that could be reached in Geneva-2 or at the public and hush-hush meetings being held around the globe to discuss the New Arab World, which is still in the making. True, the Middle East is on fire and in a state of flux. The borders set in the Sykes-Picot Agreement are still in place, but the flow of people and across these so-called artificial borders has been ceaseless. Seeping through these porous frontiers too where these peoples’ pan-Arab problems. All Middle East files have been opened concomitantly. It’s as though the world and history want to solve them all at the same time: the perennial Arab-Israeli dispute; chronic unemployment and underdevelopment; crises of democracy and freedoms; and even the Sunni-Shiite faceoff. When drawing a geopolitical map of the Middle East today, we find it leads off with the 5+1 talks in Geneva between Iran and the West. The negotiations have “temporarily” failed to yield an agreement for Tehran to suspend nuclear enrichment and for the West to temporarily lift some economic sanctions; and for the Islamic Republic to normalize relations with the West, ending its 34-year-old cold war with the United States. Sitting on the sidelines are Saudi Arabia and her Gulf partners. Israel is close by. All of them are faithfully watching what’s going on with interest. Only Israel is outspoken about her concern, fuming and threatening at times that any agreement reached will not stop her from acting alone to protect her national security. In fact, Israel is the prime mover of Western and American interest in Iran’s nuclear program, which it perceives as an existential threat. The Arab Gulf states, including Saudi Arabia, don’t see it that way. They deem it as a threat liable to tilt the regional balance of power in favor of Iran, which is eagerly striving to become the region’s hegemon. The Gulf Arabs are more concerned than Israel because the Geneva negotiations revolve around Iran’s nuclear ambitions and let pass Iranian interventionism and regional hegemony designs. The Geneva negotiations close the eyes to Iran’s obstruction of national reconciliation in Bahrain, her smuggling of arms to the Houthis in Yemen and what Prince Saud al-Feisal described as her occupation of Syria. At best, the United States would tell us a solution of the nuclear problem would be crowned by a historic reconciliation bound to solve the other issues. Such U.S. promises are empty words. Washington won’t be bothered with what it describes as “local Middle Eastern” matters that don’t threaten her or Israel’s security – matters it does not understand or wish to understand in the first place. Here we turn to the Syrian square on the Great Bargain’s chessboard. Saudi Arabia wants the conflict to come to an end because the Syria crisis is taxing her and her partners in the region by virtue of the overflow of demographic changes and the threats made by al-Qaeda to turn Syria into its homestead. Al-Qaeda is already exploiting sayings of the prophet to sign up new recruits, chiefly from Saudi Arabia. They stretch their imagination further, talking of a second deal with Egypt as the top prize and a third involving Libya. They might even dismember Syria as in the wake of the 1919 Treaty of Versailles with total disregard of the historical transformations that occurred in the region since the Arab Spring. It is wrong to resist the power of history under the illusion that the powerful can strike deals and plan the future independently of the peoples whose divisions were caused by a lack of experience in democracy. These peoples are still in a state of flux and at times furious. They know what they want but are bewildered by it. They will certainly not accept a new conqueror showing up on a white horse to lead them to a bright new dawn. The era of one-man rule is dead and gone. Labels: Game of Nations, Gulf, Hezbollah, Iran, Jamal Khashoggi, Lebanon, Nuclear negotiations, Saudi Arabia, Syria, The grand bargain, U.S.